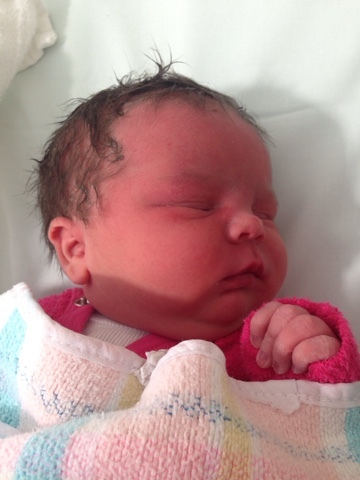 On the 31st of July I gave birth to a beautiful baby girl,that we named, Sophie. There were days where I couldn’t even sip water or any fluids, everything came up in bucketfuls. I was dizzy and fainted when I was severely dehydrated. I was constantly exhausted and the vomiting affected my gestational diabetes, making it impossible to keep under control, despite being on two different types of insulin.Being so dehydrated also at times affected the baby, making her sleepier and always making it hard for the nurses to get a good scan on the CTG. At one stage I wasn’t putting on weight,in fact,I think,I was even loosing it and in my 18 week scan the baby appeared to be on the smaller side ( though in the normal range), which the doctor suspected,because I couldn’t keep anything down. I wasn’t able to tolerate being on my medication so my anxiety was starting to shoot through the roof and I would experience horrible panic attacks where my heart would race and I felt like I was suffocating. I asked him that I would go into hospital and the doctors would find me ready to start labour with out any intrusive “procedures” to start the induction (as due to my having fibromyalgia I experience pain at a higher level ) and of cause for the safety of the baby and myself. I was lucky enough that the doctor said I could have the epidural put in before anything was started. My plan was to have a quiet, “relaxing” labour with no stress or anxiety. The labour wasn’t progressing well, so they kept turning up the drip to make the contractions stronger.At the same time the epidural wasn’t fully working so they also kept topping that up. But it never fully worked and I was getting pain with the contractions in patches, across my stomach and on the left side of my back and down my left leg. It was a horrible feeling and all I wanted to do was get off that bed and walk around and maybe sit in a hot bath! I reached a certain point in the labour and stopped progressing, also the baby’s heart rate wasn’t staying up. They discovered the baby had its arm up and its hand over its head, which was stopping the labour from progressing well and causing my contractions to be erratic. By that point I had,had enough and had burst into tears! The doctor came in and told me to start pushing even tough I wasn’t ready too. 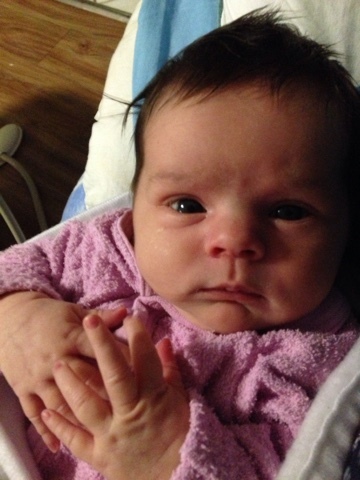 The baby’s hand fell away and she was born in a matter of minutes. The doctor said it was a miracle that the baby made it.That she has seen a stillborn because of this. As I look back on my pregnancy, I realised we had to let go of a lot of things and allow God to take care of everything. We had to put our trust and faith into God’s hands. A lot of things came down to “this moment” in our lives. This was it. This was the time in our lives where we had to make that choice. Were we going to continue to hold on to what we wanted, demand or expectant in our lives? Or were we going to put God first for the sake of our family and our marriage? For myself I had to let go of my health and leave it in God’s hands. I had to believe that what ever was to happen,would ultimately be for the best. Would ultimately bring me closer to God. In a sense I had put my life in God’s hands. I knew that the chronic vomiting and health problems that brought on suffering would be horrid and terribly hard to get through each day. But I valued the life I was carrying. Nothing was going to make me give up,even though at times, I felt, I couldn’t go on, I couldn’t give up. I believe, because the children see what I go through,to bring a new life into this world, that they, value life just as much as we do. They have learnt at an early age the value of a human life, from the moment it starts, in the womb. Being so sick I had to let go of the house-to a point! I had to humble myself and admit that it is impossible to keep a house perfectly clean with a large family to start with, but even more impossible when I’m so sick I cannot get of the couch! I had to remind myself, at the end of the day, that’s not what is important. A house is a house, God isn’t going to care how clean my house is, or if there are toys stretched out from one end of the house to the other! It wasn’t easy. It never is. But we got through it and God has blessed us a hundred fold! So many things are happening in our lives and within our family. Its amazing and we are truly blessed. Because some how, our imperfections, are God’s perfections. And for me….that’s perfectly fine. What a beautiful, incredible story! I've had to let go, myself, in many of these ways also… and at the end, I always see how God worked through it. But in those moments, it's tough! I love the topic of the post because I think too often as Christians we do not allow God to do His job. Instead we take over where He has told us to trust and this results in all kinds of stress related illnesses that we could have avoided by just letting go. Thanks for the reminder! Your more than welcome. I am so glad you loved this post. Thank you. Your daughter is so beautiful! God has a way of bringing about beauty from pain. He sure does! We are so blessed!